Hello-Hello, it seems we might be back to “normal,” although ascertaining just what ‘normal’ is continues to evolve. “In terms of style, effort, money and glamour, this red carpet mother of all fashion-fests, orchestrated by Anna Wintour for the last 13 years, outshines them all. Below we see Ms Wintour (yes, that is The André in all his regal splendor to her right) in a stunning Chanel couture gown. On the right she is with her daughter, Bee Shaffer, who wore Balenciaga. The formal name for the event is the Metropolitan Museum of Art Costume Institute Gala. 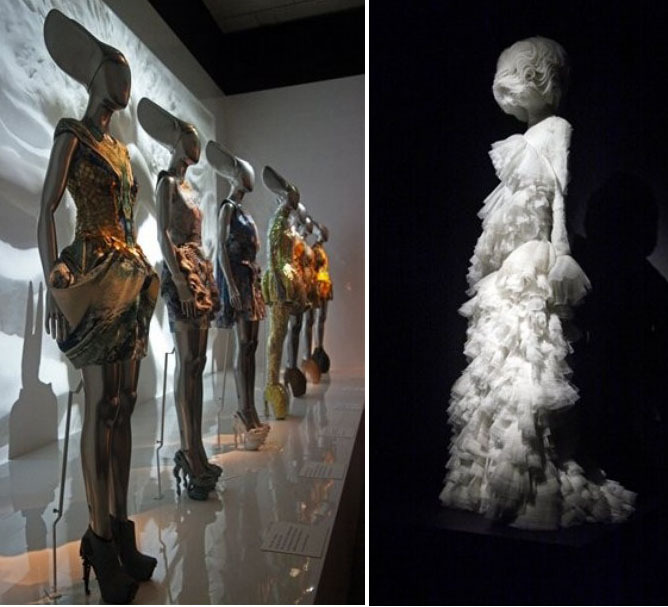 This year’s event coincides with tomorrow’s opening of the highly anticipated Alexander McQueen: Savage Beauty show. As one might imagine, coming on the heels of the royal wedding and the two Sarah Burton McQueen wedding gowns, the atmosphere was electric. Below, the woman of the hour, Ms. Burton. Sarah Jessica Parker was in vintage McQueen. Hamish Bowles was in McQueen. For those not familiar with the Costume Institute, it is part of the Met, housing more than 75,000 costumes and accessories. Below, part of the Lauren clan, left to right we see Dylan Lauren, David Lauren and Lauren Bush. Jessica Alba also wore Ralph Lauren, she was radiant. There were some figure-hugging creations; below left, Fergie in a Marchesa gown more reminiscent of a wedding dress, on the right we see Beyonce in Emilio Pucci with her husband, Jay-Z. The lights are blinding, Renée Zellweger is silhouetted below. Some of our favorite faux-prepsters from Gossip Girl were on hand, Leighton Meester was in Louis Vuitton, Blake Lively in Grecian-inspired Chanel and Jessica Szohr in… in.. umm, we have lost our notes, eek! The level of detailing on these gowns is extraordinary. Below, Dakota and Elle Fanning, both wore Valentino. Perhaps our favorite gown of the evening was Ashley Greene’s, custom Donna Karan. Last night the first menswear from Tory Burch debuted, seen on Kanye West; the designer was in vintage Jean Patou that was gorgeous. Tommy Hilfiger his wife, Dee,and Jessica Stam wore Hilfiger. It is a busy week for Mr. Hilfiger, the designer’s collaborative line with Lisa Birnbach, Prep World, launches its first pop-up store in the US. As covered in this post, the first pop-up store was in Paris. 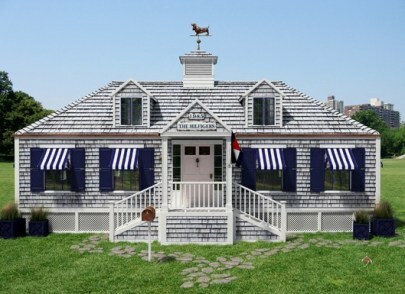 The temporary stores are designed to look like a beachside cottage in the Hamptons, below we show the model store. 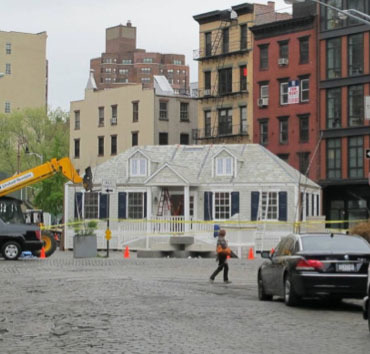 And here is the real deal under construction in the Meatpacking district, originally scheduled to open the 28th of April, now looking like it will be ready for a Thursday opening. The capsule collection features an array of products, many of them appealing. Some of the merchandise is available online. For more background on the line, click here. If interested in seeing the Paris Prep World, click here. Apologies for the brevity today, but we must race out the door! As New York Fashion Week draws to a close, we have a look at yesterday’s Tory Burch show. As in other shows, dresses and skirts ran longer, many hitting mid-calf, a marked (and welcome) departure from what we have been seeing on the runway in previous years. There was much to like, including many pieces in the navy group. Even the shimmering lamé looked tailored and glamorous, not loud or inappropriate. We very much like the navy tweed jacket on the left, as well as the trench coat on the right. But our favorite look has to be this one, right down to what looks like a wicker handbag. One of the fashion world’s most plugged-in designers, Ms. Burch uses her Facebook page, blog and Twitter account to gather opinions and share information, attributing some design decisions to feedback she receives from customers. Many celebrities were seen in the front row for the show, WWD’s Steve Eichner snapped these images of Kanye West and Aerin Lauder. 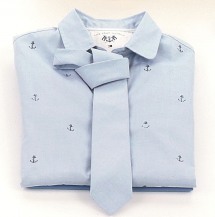 We also have images for next spring’s line from Nautica, a brand we remain fond of here at the Prepatorium. Back to womenswear, St. John showed spring styles last week. More images from Robert Mitra and WWD. We are not sure St. John, struggling for some time now, has fully found its way, although some pieces looked appealing. Ralph Gardner profiles author Lisa Birnbach in today’s Journal, “The Official Preppy Author” also offers this image of the writer. For more on Tuesday’s night True Prep event at Brooks Brothers, you may want to visit the Facebook page, there are some fun pictures from that party. Today the book tour heads to LL Bean at Tysons Corner, that would be a fun event to attend. With that we say so long until next time! 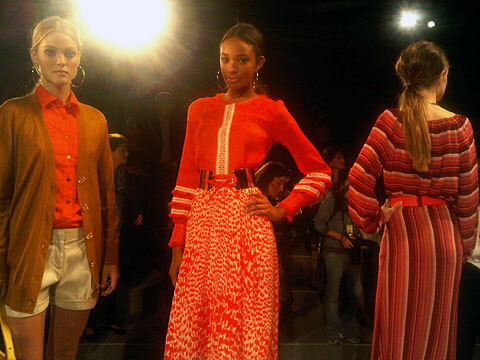 In yesterday’s post we promised more photos from the Tory Burch show at Fashion Week. As far as there being “… charming and ladyfied…” styles, we scanned each and every look and encountered difficulty locating much we would call ‘ladyfied’ in the collection. There are a few pieces reminiscent of the Tory Burch style existing customers expect to see from the designer, including this dress. As well as this coat, not entirely flattering in the shot below. The Burch show attracted its share of entertainment industry stars, including Kanye West, LL Cool J and Russell Simmons. We also promised to share more from the Tommy Hilfiger show. The collection was titled “Quintessentially Fifth Avenue” in honor of the enormous Hilfiger flagship store on Fifth Avenue opening this summer. Some may remember the coat from yesterday; we had to share it one more time. For some reason, this model looked exactly like Matt Damon to us. Today’s hottest tcket had to be the Ralph Lauren show, drawing A-List celebrities like Gossip Girl star Blake Lively. Also seen in the photo with Ms. Lively are socialite Amanda Hearst, David Lauren, and designer/model Lauren Bush. You may remember our previous posts showing other G2 stars (Leighton Meester, Chace Crawford, Taylor Momsen) at other shows earlier this week; this was the first appearance for Ms. Lively. One more shot below; we promise to share more from the Ralph Lauren show in our next post. Because we all want to pursue fiscally friendly investments, we leave you with a few more opportunities for savings, starting with the latest J. Crew promotion: 30% off Select Women’s, Men’s & Kid’s pants online and in stores. Speaking of the Crew, has everyone seen the ABC news stories about Good Morning America co-host Robin Roberts? There is a possibility she will wear J. Crew to the Oscars this weekend, as detailed in this story. The coral dress on the far left is the J. Crew, in silk tricotine. The lavender in the center is silk chiffon by J. Mendel, and the cobalt blue on the far right is a Reem Acra creation. We close with an “Adventure in Argyle,” the Four Seasons Argyle sweater on sale at Bobby Jones. Originally $275, the Men’s sweater is now $68 as part of the President’s Day Sale. 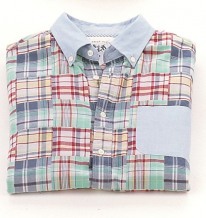 There is more Men’s merchandise in the sale than Women’s, but you may find it worth a small investment of time. Brooks Brothers & the Good Housekeeping Seal of Approval? Hello-Hello and happy start to the new week! Let us ponder the relationship between the Brooks Brothers cashmere cardigan…. and the Good Housekeeping Seal of Approval? We get a teeny bit confused by the description of results for a few of the sweaters (Land’s End and LL Bean are included), not clear about the pilling on a few. Those categorized as Not-So-Good include Kohl’s Apt. 9 Cashmere Crewneck for Misses, a shame as their argyle sweater looked cute! Also scoring poorly were two sweaters from Macy’s Charter Club. This fabulous creation is available in several colors, including black, grey, and navy. Schott is family-owned; all of their products are made in the USA, and they are outstanding investments. Obviously this is an upgrade from the Isaac Mizrahi pink pea coat at Target we shared just a few days ago. There are also mentions of Kanye West, described as ‘the Fresh Prince of Nantucket’, Band of Outsiders designer Scott Sternberg, and preppy band Vampire Weekend. We hope everyone enjoys a simply splendid week!